I'm Dominik from paint making company Metamorphose Sp. z o.o. and taday I have for sale excellent frameset which you cant see daily on streets. 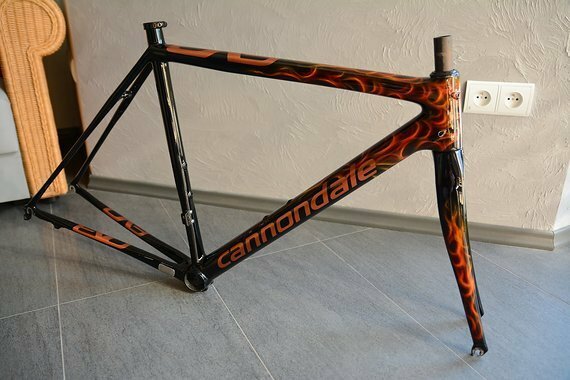 It is Cannondale Supersix EVO Hi-Mod custom painted in "GHOSTRIDER" theme. It is inspired by custom painted framesets for best cyclist in the world from ProTour. Size of this frame is 52cm. It is in great condition. Actually was used only for exhibitions. Frameset was painted by professional custom paint company. I want to sell this frameset for 700 euro. It can be shipped worldwide. More questions and pictures via e-mail. Our company is able to realize custom projects with your frameset and other parts. If you want to know more, just send me private message. BMC Granfondo GF01 56cm "goldy"